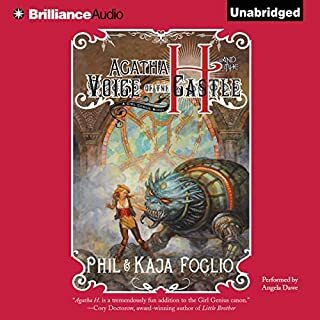 In the third installment of the Girl Genius novels, Agatha H. and the Voice of the Castle begins as Agatha Heterodyne returns to her ancestral home, the warped little town of Mechanicsburg. There she must claim her inheritance by convincing the artificial intelligence that animates her family's castle that she is, in fact, the new Heterodyne. But this apparently simple task is made complicated in several ways: An imposter claiming to be the legitimate heir appears. The Industrial Revolution has escalated into all-out warfare. Sixteen years have passed since the Heterodyne Boys, benevolent adventurers and inventors, disappeared under mysterious circumstances. Today, Europe is ruled by the Sparks, dynasties of mad scientists ruling over - and terrorizing - the hapless population with their bizarre inventions and unchecked power, while the downtrodden dream of the Heterodynes’ return. At Transylvania Polygnostic University, a pretty, young student named Agatha Clay seems to have nothing but bad luck. You, dear listener, continue at your own risk. It is not for the faint of heart - no more so than the study of dragons itself. 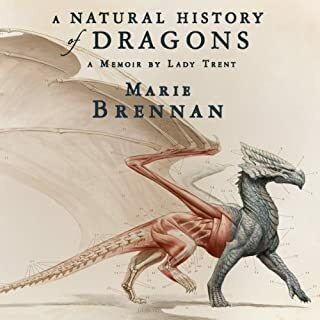 But such study offers rewards beyond compare: to stand in a dragon's presence, even for the briefest of moments - even at the risk of one's life - is a delight that, once experienced, can never be forgotten….All the world, from Scirland to the farthest reaches of Eriga, know Isabella, Lady Trent, to be the world's preeminent dragon naturalist. In a time when the Industrial Revolution has escalated into all-out warfare, Mad Science rules the world… with mixed success. With the help of Krosp, Emperor of All Cats, Agatha has escaped from the massive airship known as Castle Wulfenbach. 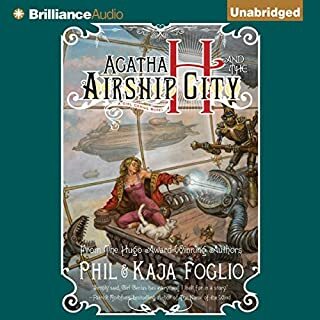 After crashing their escape dirigible, Agatha and Krosp fall in with Master Payne’s Circus of Adventure, a traveling troupe of performers dedicated to staging Heterodyne shows - dramatizations of the exploits of Bill and Barry Heterodyne and their allies - who are unaware of Agatha’s connection to the Heterodyne line. Pursued by the ruthless Baron Klaus Wulfenbach, his handsome son Gil, and their minions (not to mention Othar Tryggvassen, Gentleman Adventurer), Agatha hides in plain sight among the circus folk, servicing their clanks and proving herself adept in performing the role of Lucrezia Mongfish, nemesis to - and later wife of - Bill Heterodyne. She also begins training under Zeetha, swordmistress and princess of the lost city of Skifander. Together, Agatha, Krosp, and the performers travel across the treacherous Wasteland of war-torn Europa, toward Mechanicsburg, and the ancestral home of the Heterodynes - Castle Heterodyne. 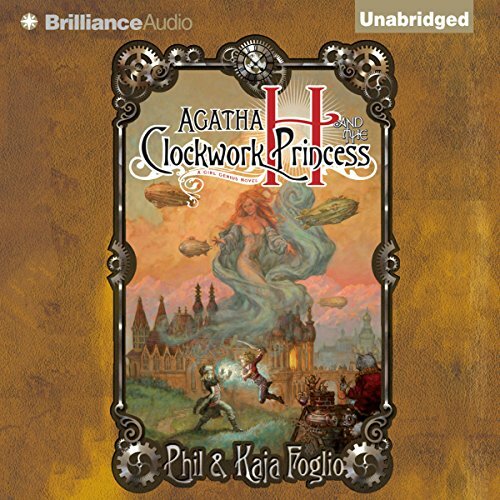 From Phil and Kaja Foglio, creators of the multiple WCCA and Hugo Award-winning webcomic Girl Genius, comes Agatha H and the Clockwork Princess, a gaslamp fantasy filled to bursting with Adventure! Romance! And Mad Science! ©2012 Phil and Kaja Foglio (P)2012 Brilliance Audio, Inc. I had heard the authors interviewed and knew about the comic, before I tried this novel. I totally loved it so much more than the comic with the performance and the voices. The audio version is fabulous! Long-time reader of the comic, which is enormous fun. The "novelizations" however leave something to be desired. The story is still quite entertaining, since it's a faithful adaptation. The writing, however, is not entertaining. Truly, the authors should keep to their stellar webcomic and get a better prose writer to adapt the comic to book format. Choppy in places, teeth-grating use of dreadful dialogue tags (one of my biggest reader peeves) and the POV issues.... just no. The head-hopping from paragraph to paragraph is enough to make me rip my hair out. A truly successful omniscient point of view is difficult to accomplish. The Foglios fail to do it. What saves the audiobooks is Angela Dawe--she is very good. I will listen to it again, almost solely because of her. Now, I know that the first book in this series wasn't perfect by any means. However, I found it to be an entertaining jaunt. I figured it's sequel would be much the same. Unfortunately, it seems I was completely off base with that prediction. Clockwork Princess pretty much took all of the things in the first book that I liked (The entertaining and/or interesting cast of characters, comedy, a love interesting who doesn't make me want to gouge my ears out, a tolerable main character etc.) and threw it all out the window. Instead we get a cast of carnival folk who are neither entertaining as a group, nor interesting on an individual basis, and a boring love interest who is clearly set up not to be the main lasting one because he's just too... well... boring. And, also, they have nothing in common. (Seriously, what's the point of bothering with a love triangle if you're not going to attempt to make the hypotenuse a feasible choice for either the reader or the character.) This group of characters spent, like, ten hours being dull and not quite interchangeable but still too numerous and unimportant for me to feel invested in, without actually furthering the plot much, while Agatha develops a bad case of Special Snowflake Syndrome. 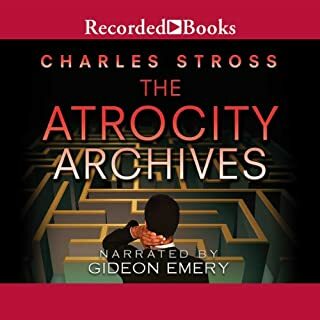 The plot finally shows up in like the last 6-8 hours hours of the audiobook. However, I've already trudged through 10+ and so I can't bring myself to care at this point. Plus it's as a result of a ridiculous turn of events that would have been fine if this book had retained the silly, fun tone of the first book. However, it did not, and so just came off as stupid. Also, more Agatha is special and another idiot in love with her barf. The very last clash is probably the only truly entertaining section of the book, but it comes to little too late and is not really worth it. On a positive note, the narrator was lovely, though I feel she did better in the first book. It was obvious that she was running out of distinct voices for the vast, mostly useless cast of this one. The jaegermonsters were, as always, entertaining, and the only new folks I actually liked. Krosp was still great, though not actually integral to the plot, unfortunately. And the footnotes were a nice touch that often held stuff more interesting then the actual story. All in all, not one I'll ever touch again. Should have been 6 hours shorter. A great listen and full of humor. What made the experience of listening to Agatha H. and the Clockwork Princess the most enjoyable? 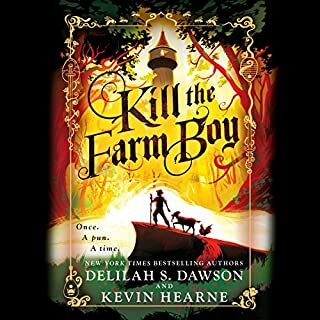 The humor in the story and the narrator's use of different voices. What was one of the most memorable moments of Agatha H. and the Clockwork Princess? When you discover what all the little clanks Agatha has made are really doing. It is hard to have just one. I sure hope the Authors continue the story, I can't wait to find out what happens next. I enjoyed it more than the comic because I was able to visualize the characters for myself. The comic depiction of the characters was different that the picture I had created in my mind. I enjoyed Claus, because he is strong, but confused. He is controlling, controlled, and completely oblivious and I enjoyed that. Loved it! Left me wanting the next book now. The Foglio's smashed this one out of the park. The reader was spot on! I am impressed! It's a good story in a steam punk universe, the characters are entertaining, it's not predictable, and the preformance is pretty good. 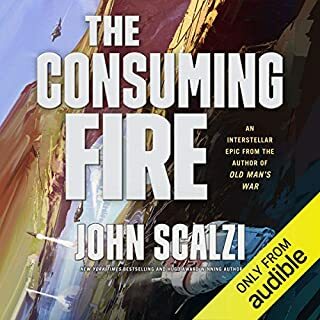 I listen to audiobooks to keep me productive while I work and this one served that purpose. Fun look into a world that could have been. Super science and action, only Jackson could make the movie. Continuation of a darn good yarn. If you could sum up Agatha H. and the Clockwork Princess in three words, what would they be? The first book moves smoothly into the second book that I could not tell where the first ended and the second started, I love these stories. The girl genius is my faverite Charice. Not because she is the main character but because she is where all of the action is and the stories are after all about her. Have you listened to any of Angela Dawe’s other performances before? How does this one compare? Ms. Dawe's narration of the stories makes the characters come alive. I can almost see the countryside and the characters as they move through the stories. Their places in all good stories that grab my attention, and in the style of all great science fiction writers Phil and Kaja Foglio have in my opinion captured that essence. These stories are the type that you can enjoy at any time and I do. I am sorry that Audible and Phil and Kaja Foglio have not published more fo the tails of the Girl Genious on Audible. Great story continues to make you want more. Great story continues to make you want more. The characters are beautifully written and the reading stile is great.